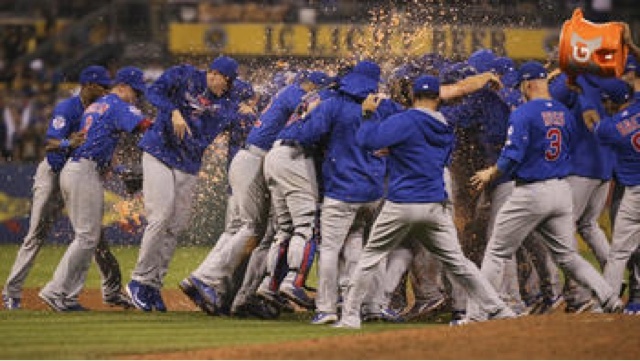 I wrote Chicago Cautiously Optimistic About Cubs going to World Series for posterity. As of today, the Chicago Cubs are up 2 to 1 against the St Louis Cardinals in the NLDS. If they win today, they move on to the NLCS. Even if they don't win today, they have one more chance Thursday in St Louis. They will win the World Series. BUT...Cubs fans have been here before. There was a big drought between their last WS appearance in 1945 and even making the playoffs until the 80s. And of course there was the 2003 being 4 outs away and losing because of a botched double play and a tired pitcher, not an over zealous fan. Update: well we now know how this turned out. Still, there are a lot of positives to take from this outcome. First, no one expected the Cubs to make the playoffs, let alone get so deep. Second, they were very classy in the way the reacted to being swept by the Mets. Third, they did not lose because of some curse but perhaps because they faced a team they didn't face as much during the regular season as they did during the wild card and NLDS series. Finally, while this is at least in part wishful thinking given the 2004, 2007 and 2008 clubs, this team should do well in 2016, perhaps winning the division and having more home field advantage opportunities, assuming the maintain the core team and make a few tweaks here and there.